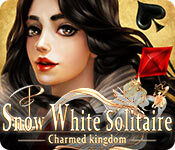 Snow White Solitaire: Charmed kingdom is rated 4.2 out of 5 by 16. Rated 5 out of 5 by cceepp from Wonderful! This game surprised me in a good way. I love to collect solitaire games so I got this one too after a short demo. I wasn't expecting it to be so well done. Beautiful graphics. I love the art nouveau theme. It plays really well. Excellent! Rated 5 out of 5 by Luna_soul from Great Solitaire Game I have played a few solitaire games I enjoy playing but this is by far the best. The gameplay is a little different from the norm. 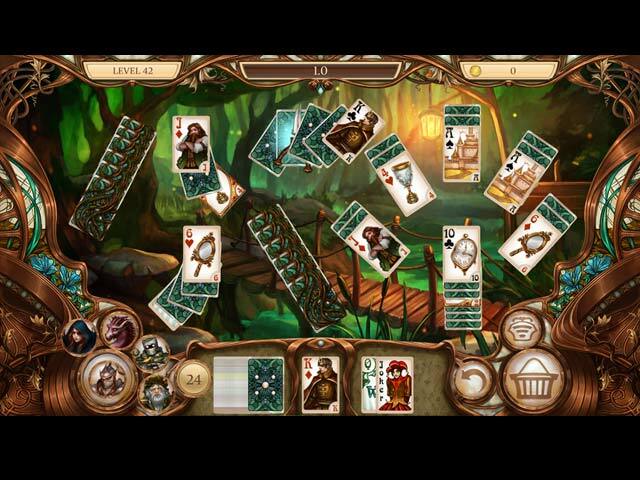 I like the way the card games and hidden object games are integrated right into the story line. I am normally pretty good at getting perfect scores but they are not so easy to come by in this game. I guess I have to buy things at the store to help me out. The story was engaging enough for me. Everything in this game help feel in the atmosphere of the Middle Ages! This game has beautiful and spectacular artwork. I LOVE the music in this too. Rated 5 out of 5 by Marja67 from Good and relaxing I really like this one. Relaxing, that is what I need in between all the hard puzzles I do. Keep the mind moving. Important in life. Rated 5 out of 5 by persephonie from I loved it Ok I have to confess despite years of playing computer games I am a Newbie to solitaire games . I still play with a pack of cards! Until recently that is, and I am seriously impressed with the quality of the recent games I have tried . This one is definitely up there with the best. The instructions and bonuses are clearly put into the gameplay as you progress. Beware this game appears simple BUT some of the extra challenges are there to make you really think I had to drag myself away as I tried to better my score one more time . As a Newbie I am not experienced enough to go into the merits of it as a stand alone game. I just loved it Oh and it looks beautiful as well . Rated 5 out of 5 by raydog from This game is excellent! I love all the solitaire games and it is very rare for me to not buy one. That being said - this one rocks! I love the graphics, collecting the coins for the power ups, the side games - eg the jigsaw puzzle, finding all the pieces of the sword and key. I also love the characters. The levels are challenging and I did have to play some of them a few times to get three stars - There is no other option when I play these games. Three stars or I start over. The only small issue I had was when the cards themselves had the power ups on them. It was hard to see the actual number on the card - I'm 64 so it probably isn't a problem for younger people. Terrific game! Rated 5 out of 5 by pennmom36 from BEAUTIFUL GRAPHICS, BEAUTIFUL MUSIC, RELAXING SOLITAIRE I realize that Solitaire lovers keep asking BF for something different than the Higher/Lower type solitaire. I agree that there are a ton of other Solitaire games out there, but I also realize that every time Solitaire games are offered with several varieties, they are horrible games that are highly criticized. Therefore I understand why developers are leery to produce a game that sits on the shelf collecting dust! Once you start offering a more complicated version, it's difficult to incorporate features that will appease everyone. Looking back on games that tried (and ultimately failed) such as Solitaire 220 & 320 Deluxe, just about every reviewer had a different feature they liked or disliked, and personally, I only enjoyed a few of the hundreds of types offered. Higher/ Lower, Spider and Tri-Peaks are my go to Solitaire games, and only when they have specific features, particularly the option to remove all cards on the board, not just "special" cards. 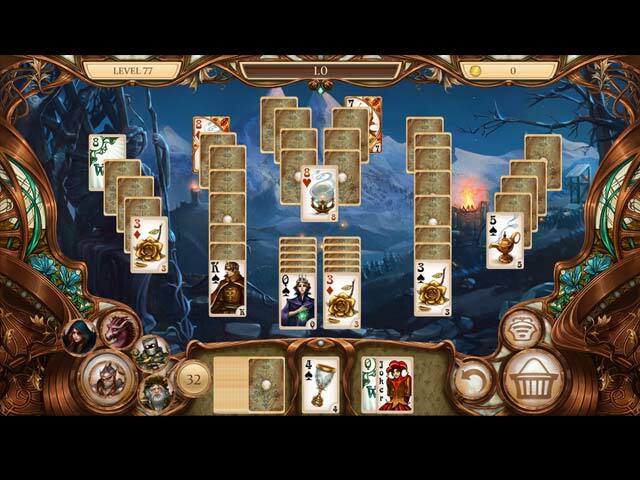 Snow White Solitaire has all the features I want in a Higher/Lower type Solitaire game, and really none that I don't like, and I will buy this game to pick up where the demo ended. 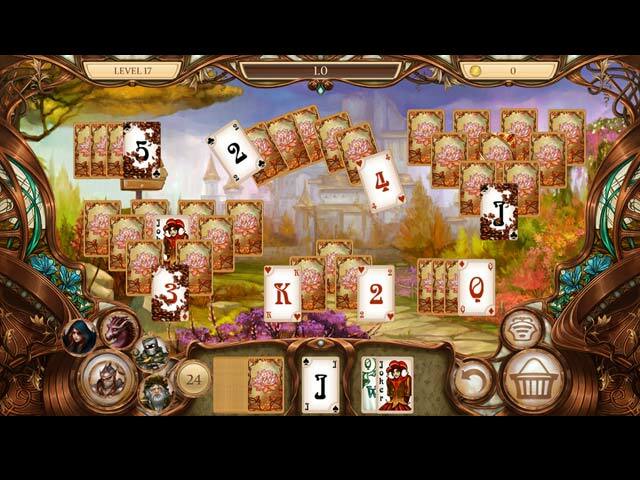 This game is very similar to one of my favorites, The Chronicles of Emerland Solitaire, but with much better graphics. You can choose from 4 different card themes, and 2 face card fonts, and there are 14 Achievement Trophies to earn on your journey through the Cursed Kingdom, to find 5 Magic Beans required to lift the curse of eternal slumber. The goal is to earn 3 stars per level, and any level can be replayed as often as needed, if you want to earn all 3 stars. If you remove all cards from the board, you'll earn 3 stars, if 1 or 2 cards remain, you'll earn 2 stars and if 3 or 4 cards remain, you'll earn 1 star, if 5 or more cards remain, you won't get any stars, and you must earn at least 1 star on every level to unlock the next world. There is an Undo feature that allows you to undo your last move, and each level allows for a single use. Bonuses appear randomly on some of the cards, but only temporarily, so if you're not able to use that card within a few seconds, it will disappear, but usually reappears fairly quickly on a different card. The type of Bonus varies, the Coin will give you 50 extra coins if you're able to include that card in a chain, and the Tornado will reveal 2 random face down cards on the board once you include the card in a chain. You will occasionally earn number specific Wildcards and Jokers as you progress. Obstacle cards are eventually introduced as a challenge such as cards with Leaves that require two plays, the first time the card is used, it removes the leaves, the second time it's included, will remove the card entirely. As you search for the Magic Beans, Helpers will join you on your quest. During the demo, the Knight offers his service to swap a card from the deck, with a useful card. You can upgrade the Helpers abilities with the coins you earn, in the shop once they become available. Eventually the Goblin, Golem, Dragon and Sorceress will join forces with you. You can also purchase the Titan's Eye Amulet that let's you see available moves on the board, the Amulet of Hermes which adds two cards to the deck at the beginning of each level, or purchase Jokers to use as a wildcard. I found this game very relaxing, with beautiful 2D graphics, soothing Music, a good storyline, and all of the must have features I want in a Solitaire game, such as removing all cards from the board, not just the special cards and you're done with the level even though regular cards still remain. Give it a try, especially if you enjoyed The Chronicles of Emerland Solitaire which is very similar, enjoy!